Early detection of cancer can significantly improve outcomes for patients. We manage bowel, breast and cervical screening programs to identify these cancers early. Cancer screening can help detect cancers early, even before you have any symptoms of the disease. Screening programs offer free tests that detect cancers in the early stages - this means people have more effective treatment options, and better outcomes. We work to raise awareness of the early symptoms of cancer and encourage people to take appropriate action if they identify these symptoms. Cervical cancer is one of the most preventable cancers—having a Cervical Screening Test (formerly Pap Test) is currently the best way to prevent it. Find out more about NSW Cervical Screening Program. Australia has one of the highest incidence of bowel cancer in the world—find out why screening is important and how you can take part in the bowel screening program. The chance of surviving lung cancer is best when the cancer is diagnosed at an early stage—know the signs and symptoms to look for. 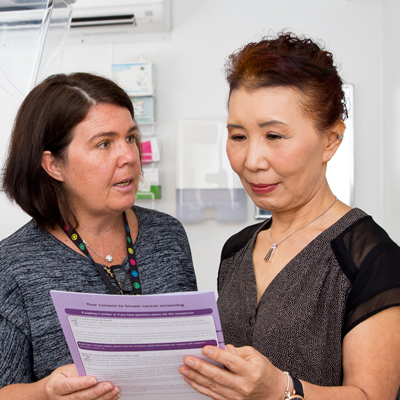 The Cancer Institute NSW is working collaboratively across the sector to increase primary care engagement with screening, and ultimately increase screening participation rates across NSW.